Recently one of the leading companies has unveiled Samsung foldable smartphone that will come early next year. Justin Denison, a senior vice president of mobile product marketing, has introduced a prototype with a screen that is measured 18.5cm (7.3in), at the unveiling in San Francisco. Samsung foldable smartphone appears to resemble a thick phone when it is folded, but they did not give media or developers a chance to touch or see the device up close. The important news of event is that a new Android-based device will come early next year, claims Dave Burke at conference in California (vice president of engineering for Google’s Android software platform). Google’s head of Android UX, Glen Murphy, also made his speech indicating that Google would work with the developer community to bring more features to the phone. Joshua Clark, a developer who was at the conference, said Samsung needed to sell the technology to its competitors for the product to be widely adopted. “They’ll have to prove that it’s more than just a gimmick,” said O’Donnell. “But it’s smart to open it up to developers early to do different types of experiences.” Bob ODonnell (an analyst with Technalysis Research). But Samsung is not the only one who is developing foldable phone, Huawei (read here) has also some plans to do it. So according to theguardian Huawei’s 5G smartphone foldable phone will come in mid-2019. 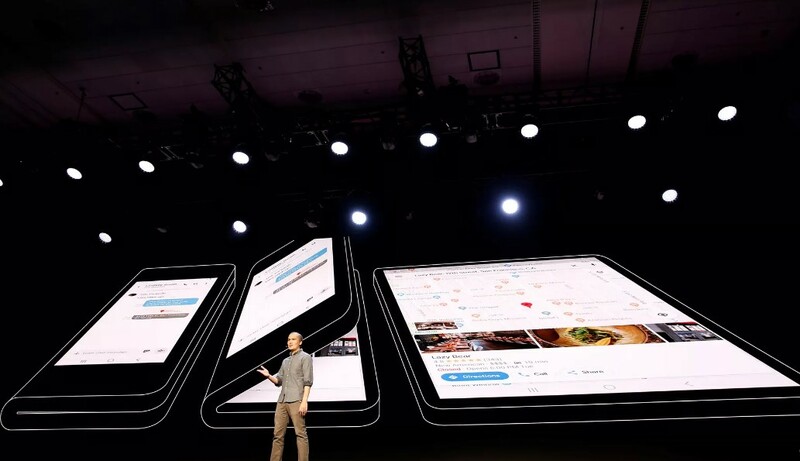 Samsung and Huawei, however, have been beaten to the market by Royole, a Chinese display making start-up, which last week unveiled a foldable Android phone with a bigger screen, priced from around $1,300.